George Graham Reviews Solas' "The Words That Remain"
The past few years have seen a virtual explosion of interest in traditional Irish and Celtic music. Everything from the popular Riverdance production to television commercials with a soundtrack by Enya have provided a lesson to millions of Americans that Irish music isn't just overly sentimental tenors singing Danny Boy. In the 1970s, the Chieftains began to bring to American audiences some of the great traditional music of Ireland: the jigs, reels, airs and the like. Since then, the music has flourished with growing numbers of fans on both sides of the Atlantic, being able to choose among some very good groups and performers running from quite traditional to rock-influenced to the dreamy synthesizer-saturated new age that Enya and Clannad have been doing recently to great commercial success. Of course, for 150 years, the US and Ireland have had close familial ties with the great migration from Ireland that took place. So not surprisingly, there has been some excellent Irish music coming from this country, and this week we have a stellar example. 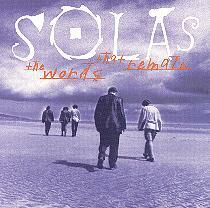 The CD, entitled The Words That Remain, is the third recording in as many years by Solas, which can accurately be described as an Irish-American band, with members from both sides of the Atlantic, and some members who have lived in both Ireland and the US. And once again, Solas has come up with an astonishingly good record. Solas got started only about three years ago, founded by 28-year Pennsylvania-born multi-instrumentalist Seamus Egan, who lived in Ireland for a few years while growing up. He developed an enthusiasm for Irish music which soon became a passion that eventually led to his winning the highly competitive All-Ireland championships on four different instruments, the first time that was done by a single individual. Guitarist John Doyle is a native of Dublin but has been living in New York, where he was a part of the group Chanting House with Egan a few years ago. Vocalist Karan Casey is also an Irish native, but came to the New York to study jazz singing at the Manhattan School of Music. Violinist Winifred Horan is a native New Yorker and studied at the New England Conservatory of Music, and also racked up honors in the all-Ireland competition, and won awards for her Irish step-dancing. The newest member of the group, who joined since the last album, is Irish-born accordionist Mick McAuley, who replaced original member John Williams who left the group last summer. Solas' eponymous debut album was almost universally acclaimed as heralding one of the most significant new traditional Irish bands in a generation. The group combined blazing instrumental virtuosity with a rare ability to balance the traditional with a good deal of eclecticism. Karan Casey's wonderfully appealing vocals, and the group's downright exhilarating performances of instrumental pieces was quite remarkable, an excellent antidote to the wimpy New Age Irish or stiff performances with squeaky fiddles that seem to be everywhere one turns. Last year's follow-up release Sunny Spells and Scattered Showers showed that their debut was no fluke. They again treated us to exceptional musicianship, together with a spirit and enthusiasm that's very difficult not to become caught up in. Now on the Philadelphia-recorded The Words That Remain Solas has lived up to its goal of avoiding repeating themselves. With their new accordionist Mick McAuley fitting easily into the big shoes left by John Williams, they again dazzle us with a combination of virtuosity and good taste. And this time, they cast a somewhat wider net for material, including songs by Woody Guthrie and Peggy Seeger, along with the usual helping of traditional music, and contemporary and original compositions very much in the traditional style. For this album, they are joined by a pair of significant guests, both of whom come from a bluegrass background, banjo maven Béla Fleck of Flecktones fame, but who is a keen enthusiast of Irish music himself, and singer Iris Dement, who does a very nice vocal duet with Ms. Casey on the Peggy Seeger song. They are also joined by percussionist John Anthony, who also appeared on their last album. The Words That Remain, the new third CD in as many years by the Irish-American quintet Solas is another remarkable record by a bunch of still-young musicians who are just so good it makes your head spin. Their virtuosic playing is combined with an extraordinary sense of good taste to set new standards for contemporary Irish music. They are not afraid to bring in different influences, and even turn their attention to songs from American folksingers. But they do it all without losing their traditionalist credentials, never crossing the line into being a novelty. Sonically, the album is quite commendable. Seamus Egan produced the CD, with engineering by John Anthony, who also played some of the album's percussion. The recording conveys the interesting mix of acoustic and subtle electric instrumentation, and captures most of the clarity of the acoustic instruments well. The dynamic range is fairly good, though some songs do sound a bit compressed, and could have had a more open, airy sound. But overall, it makes for worthy listening on a good sound system. In only about three years, Solas, in Pennsylvania and New York, had become one of the most acclaimed of the new generation of Irish and Celtic groups -- winning accolades on both sides of the Atlantic. Their new album should underscore their position. One could not ask for better musicianship.